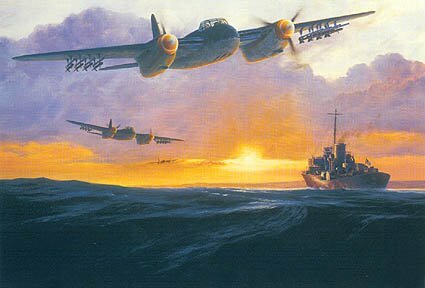 Mosquito FB VIs of 143 Squadron, Banff Strike Wing, armed with 25-lb solid armour-piercing rockets on a mission over the North Sea early in 1945. Based at Banff on the East coast of Scotland, the Banff Strike Wing was formed in 1944. Its primary role was to combat the threat of enemy shipping operating from bases deep within the Norwegian fjords. An exclusive Giclee canvas edition of just 25 is also available.